Horde NPC called Motla. She is located in Grand Bazaar, Dazar'Alor. Picture of the Dazar'Alor map. See where the pointer is. 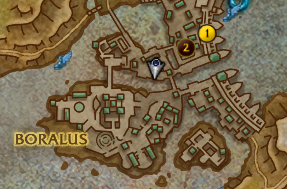 The new location as of live is 52.5, 48.0 for the alliance vendor. This is to help prevent anyone such as myself get lost and attacked by thugs for almost an hour trying to find her. On live there is a Trade gods vendor, Henrik Wyther at 73,26 11,15 in Tradewinds Market that sells most of whats needed for proffessions. Hes beside the Enchanting trainer. I just uploaded a video providing the location of her whereabouts. You need to find her in order to purchase Distilled Water and Acacia Powder (assuming you don't own an expensive longboi). For Alliance, this can be purchased from Henrick Wyther in Tradewinds Market, Boralus (73, 11). He is standing south of the pit with the Blacksmithing trainer, in a stand with a lot of maps. As mentioned by Thalgir, you can buy it from Henrick Wyther in Boralus: he's the NPC you deliver the crafting ingredients World Quests.